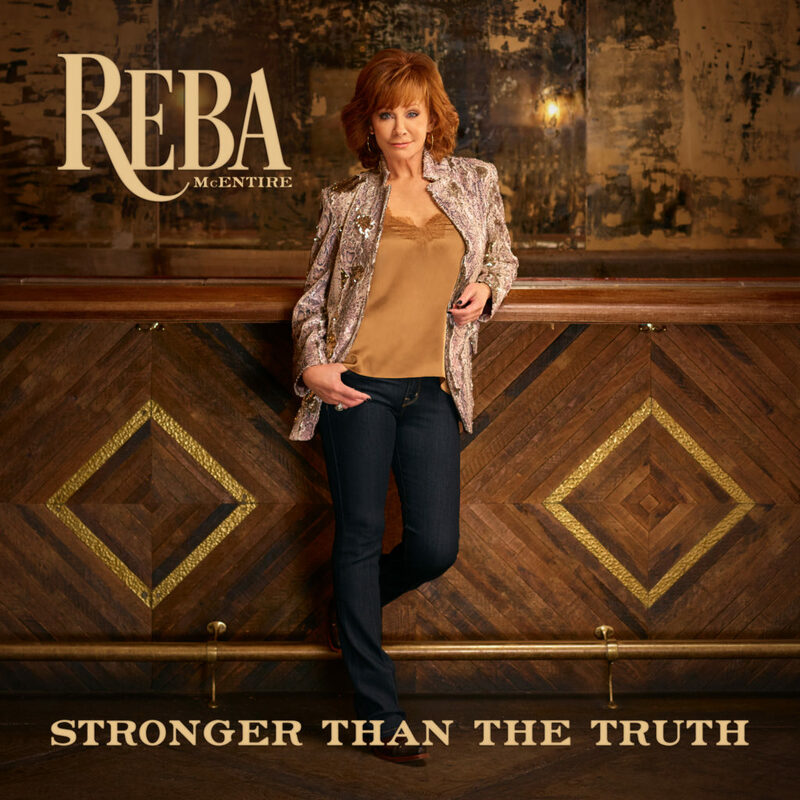 Reba McEntire is playing an intriguing PR game for her new album, Stronger Than the Truth, out today. While one might think the industry would be abuzz with news about the album and its making, Music City (and the rest of the world) are actually focused on her personal life – because she and Big Machine crafted it to happen that way. The album does have a lot to do with love, but I don’t necessarily agree with giving in to the 24-hour cycle and parading one’s personal life in order to sell albums… or how it really will sell albums outside of a small percentage of fans who are invested enough to know and keep track of the intimate details of a public figure’s life. While we applaud her for moving on from her divorce over four years ago and finding a new love, we aren’t here to discuss what’s happening at Chez McEntire. Without further ado, let’s review her brand new music, which, by the way, premiered at number 2 on the iTunes country chart. Way to start off on the right foot. Reba McEntire is one of the greatest country singers, well…ever. Whether she is penning her own or making expert selections from other writers, the woman knows how to pick a good song that will resonate with the audience she’s built up since the late 1970’s. Her newest album is no exception to this rule; every track was made for heartbreak, healing, and that little party phase we all go through when we finally wipe our tears and decide to move on from that last broken love. This feels like a legacy album from a legacy act, but that isn’t a bad thing. McEntire isn’t trying to reinvent herself or find a new vein from which to tap more success. She doesn’t have to. She’s good at what she does, and she’s been good at it for forty years. If I were to review this album as a whole, there wouldn’t be much of an actual review. It’s good. It’s perfect. It’s classic Reba. She hasn’t strayed from her style and we adore everything she does. She’s the queen of tears and revenge; Taylor Swift Eat Your Heart Out, Mama’s still got it. Instead of that enthusiastic but subpar response, we’re going to take this track by track to make sure there isn’t an ounce of heartbreak missed. Swing All Night Long With You: Arguably the most classic composition on the album, “Swing All Night Long” is reminiscent of the old Western Swing tunes one might hear from Bob Wills or Patsy Cline or, more recently, The Time Jumpers or Asleep At The Wheel. Perhaps, too, it’s a little nod to her original mentor and manager, Red Steagall. This song, with its cheeky lyrics and upbeat rhythm, fits in well with some of McEntire’s greatest recent hits like “Oklahoma Swing” and “I’ll Have What She’s Havin’”. Stronger Than The Truth: Well, at least she put a happy song first to anchor the album. This is the epitome of classic Reba McEntire; heartfelt and absolutely heartbreaking. Penned by Hannah Louise Blaylock and Autumn McEntire (Reba McEntire’s niece), this is the kind of song you feel down to your bones. Storm in a Shot Glass: It wouldn’t be a Reba McEntire album if there weren’t one song to remind us all how badass women can be, especially when we’re mad. Yet another instant party classic, this power mantra is an impressive one. Surprisingly, some of her best vocals happen in this song. I usually enjoy her voice when it is tempered more and she isn’t belting, but there’s no denying she rocked it on this track. Besides which, one can never, ever go wrong with a song written in any part by Leslie Satcher. That’s just a fact. Tammy Wynette Kind of Pain: Dang, Reba. This song could make one mad at the husband they’ve never even had. A clever and touching homage to Tammy Wynette; Brandy Clark, Mark Narmore, and Shelley Skidmore have outdone themselves. The soft vocals on this song bring about a heartbreaking vulnerability and acceptance of loss. Anyone who’s been cheated can relate. Cactus in a Coffee Can: There is a song that’ll suckerpunch you on every single Reba McEntire album. For me, this was that song. Part of the power behind McEntire’s music is her ability to knock down walls to expose the things we’ve tried our best to hide. There’s truth and sadness and vulnerability and hope mixed into every 3-minute composition. I’ve known I was going to write this track by track review, partly tongue-in-cheek, for over a month. I’ve sat with this song and listened to it again and again for the same amount of time. I’m still not sure I’ve found the words to adequately describe the first time I heard this song, how it reminded me of my own mother and the women who have come into my life in her place, how I understand the sadness of not speaking to, much less about, your mother because silence is easier than the sadness you’ll find if you try. Music should draw our emotions out, make us cry, and help us heal. Reba McEntire makes that happen damn near every time she opens her mouth. Yes, you can absolutely count on the fact that writing that got me all misty. Knock it off, Reba. Your Heart: While this is probably the least exciting song on the album, it is by no means bad. It is so far outside of McEntire’s classic style that I had to listen twice to decide whether or not it was something I liked. Though the composition and emphasis on the Spanish guitar are a departure from her classic style, McEntire embraces this song with enough bravery to sell it even if it isn’t as “stone cold country” as some others on the album. It may not be stone cold country, but McEntire and her session band still opted for organic instruments and an authentic, well-rounded sound. Way to go queen, you avoided that clap track. The Clown: I have loved this song since Hillary Lindsey recorded it in 2008, so I was thrilled to see it made the list for McEntire to record. Concentrated in her lower register, McEntire achieved such a rich quality with her vocals in this one. The concept itself isn’t inventive for McEntire; we’ve oft seen her lonely on a plane, in a restaurant, even in an empty house ala “If I Were a Boy”. That’s the joy of it; she is so damn good at it, she no longer has to be inventive, which is why this album reads more like a musical autobiography than anything else. No ‘U’ in Oklahoma: Cheekiness at it’s best. God Bless Reba McEntire and Ronnie Dunn. That’s all. The Bar’s Getting Lower: You’re either going to love this song because you’ve lived it and survived it, or you’re going to hate it because you’ve lived it and don’t want to talk about it. Regular readers know that Erin Enderlin is one of our Lula favorites, so it’s no surprise that this track is in the top four of my most liked. When I heard that Enderlin had a cut on Reba’s album, I was ecstatic for her. The newly minted queen (as in minted by me right this very moment) of sad honky tonk tunes did not disappoint. With her co-writers Kelly Collins, Liz Hengber, and Alex Kline, these four wrote a fantastic (maybe kind of hard to swallow) song. 21st Century “Is There Life Out There”? I think so. In His Mind: The storyline is muddled with some confusing lyrics in the middle of verse two. Is it their wedding announcement he’s looking at? Did she leave him and marry someone else, only for him to succumb to Alzheimer’s and forget their earlier demise? Worst of all, did she die and he doesn’t remember? The open ended nature of the lyrics makes for an unclear message. It’s a solid songwriting effort and McEntire sells it with her voice, but it is far from the strongest on the album if we’re looking at lyrics alone. I will say that I find it refreshing that McEntire is putting pen to paper and sharing what I suspect are not the first songs she’s written with the world. Writing is hard, and each style brings its own difficulty. While one can tell the song was written by someone who doesn’t write every day, one can also tell that it was carefully crafted for musical integrity. And I’ll say this: McEntire produces songs people can relate to. If any of this were a part of my recent personal story, I’d probably feel differently about this song. I can think of at least two people who’ve recently lost their mothers while their fathers remain. I can’t imagine how powerful this song is for them- and that’s the joy of what McEntire does. Freedom: Everything about this song, from the nearly spoken opening verse to the powerful crescendos throughout, is perfect. This feels like such a victory ballad. Yes, McEntire is in love and shouting it from the rooftops (which is not speculation since it has been published darn near everywhere), but McEntire has also released two albums with great success since walking away from an entertainment company she helped to build from the ground up. This song feels like the culmination of the life story she’s publicly shared in song; she’s in love, she’s thriving, she’s found her own professional voice again and it’s never sounded better or more free. Besides, it’s just a damn good song. You Never Gave Up On Me: This song was a lovely way to finish out this album. Rather than a farewell, McEntire offered a “thank you” and dedicated it to her mama, who has also very publicly been by her side, pushing her daughter to succeed the best she can for the last four decades. Whether a mother by blood or one of the heart, may we all find someone who inspires this love, belief, and gratitude in each of our lives. It’s easy to find things to critique if you break any album out track by track, but overall there isn’t a single thing ‘wrong’ with this project. McEntire has delivered another fun, powerful, musically strong series of songs. She stayed true to her style while still finding some room to experiment and play, and the result was comprehensively pretty great. Perhaps we’ll see another Grammy nom in her future soon. After all, the Grand Ole Opry and Hollywood Bowl member has won 16 ACM Awards, 15 American Music Awards, 9 People’s Choice Awards, 6 CMA Awards, 3 GRAMMY® Awards, a GMA Dove Award and a National Artistic Achievement Award from the U.S. Congress, in addition to other philanthropic and leadership honors. Let’s not forget her recent Kennedy Center Honor. McEntire’s most recent album can be streamed on Spotify or purchased for download on Apple Music. Fans can purchase bundled CD’s and vinyl’s on her website. Don’t forget to tune into the ACM awards this Sunday Night, April 7th, at 8:00 pm EST to watch McEntire host the show.